You know when you're wearing your cool new sneakers and you step in a giant puddle of mud? And then you have to eat all the mud to get your sneakers clean? Of course you don't. Only an idiot would know what that's like! 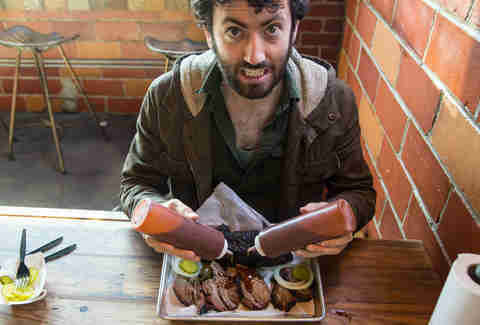 Just like only an idiot would purposely dunk his brisket into a puddle of putrid barbecue sauce. See, I hate barbecue sauce. If your taste buds are indeed the friends that their name suggests, you would too. 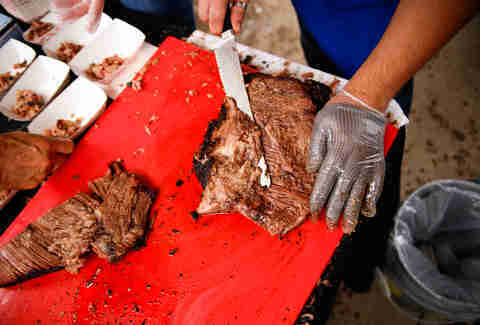 But barbecue eaters of the world, you are being fed lies! Sauce does not taste good! Those bitchy, flavor-conveying receptors in your mouth may be telling you that mustard-water tastes fine, or that it's a great idea to dunk pulled pork in vinegar, but you are being cheated. But let's not argue about your idiot taste buds. There are more pressing issues at hand! 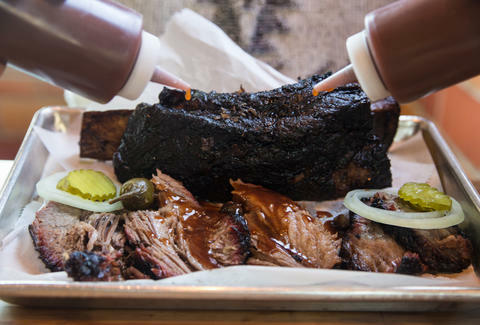 Specifically, an explanation of why you should never use barbecue sauce again. Here it is. People spend an ungodly amount of time making an otherwise rugged piece of meat as soft as a cloud. During the course of a 15-hour cook, a brisket soaks up enough smoke to asphyxiate an entire family's worth of mouth-breathing sauce users. The amount of water that goes into raising a cow is an ecological nightmare. When you douse the meat in sauce, the majestic, savory fruit of all this labor is suddenly just a vessel for vinegar and brown sugar. You're suffocating its flavor in glorified ketchup and you simply can't taste the hard work. You might as well be eating a limp slice of bologna that was dropped on the ground after someone spilled apple cider vinegar on that same part of the floor and then didn't wipe it up. Which is something a sauce lover would probably do. That's why we have so many stained floors. I've gone on record about my feelings for mustard. I've yet to weigh in on vinegar, which is almost equally offensive to my dainty palate. 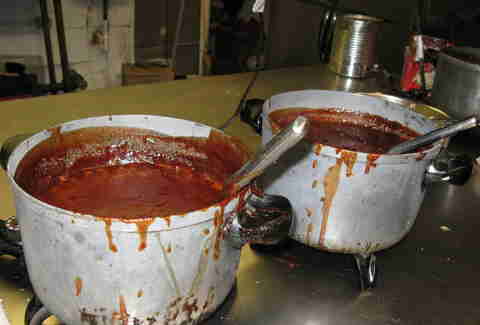 In Texas, where I proudly reside, we're more tomato-based, but ketchup soup isn't exactly something to celebrate, either. You can dress up all these core components with fat and butter and oil and molasses and a handful of spices that you're great-grandfather wrote on a scroll and hid under a national monument, but when it comes down to it, there's no amount of complexity that makes these things worthwhile. You might have a beautiful pair of curtains, but if they obscure your view of the outside world, well, it doesn't matter how well they match the carpet (which, in this specific instance, is made of beef). Despite my vitriol toward mustard, I don't hate all sauces. My fridge is basically the Ellis Island of different condiments. Give me your tired (Sriracha), your weak (salad dressings), your huddled masses (all of these hot sauces), I'll give them a temperature-controlled home and a poorly prepared savory dinner for one to spruce up. But barbecue sauce is not invited to join my dinner, because it's like the Kool-Aid Man smashing through whatever I put it on. It just obliterates everything. If it were a kindergartner, its report card would read "does not play well with others." And not because it's some anti-social creative savant, but because it steals other kids' toys and returns them covered in molasses. I can sympathize with home cooks that need a crutch for their barbecue to lean on. I really can. But if you're a barbecue professional, you should be better than that. 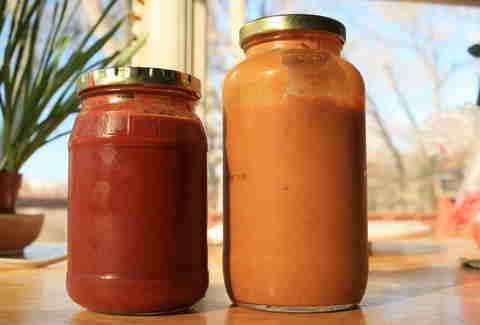 Your pitmaster's sauce should be blood, sweat, and tears that you wipe away from yourself before touching the meat. You've chosen the path of the righteous meat-maker. As a carrier of the flame, you have a responsibility to take enough pride in your product to let it soar like a salt- and pepper-rubbed eagle. There's just no excuse to let it wallow in a muddy gutter of vinegar and mustard. Dan Gentile is a staff writer at Thrillist. Despite all his rage, he would take barbecue sauce over mustard any day. Follow him to more condiment dilemmas at @Dannosphere.